While ICC has welcomed the decision to cut emissions from deforestation, high levels of uncertainty still remains around ambitions for emissions reductions, how they would be applied and how an agreement would work in practice. While the Warsaw climate compromise keeps hope for a global climate agreement, ICC said that longer-term predictability and clear market signals were vital to managing the impacts of climate change and to unlocking the role of the private sector as solutions innovator, financier and investor. 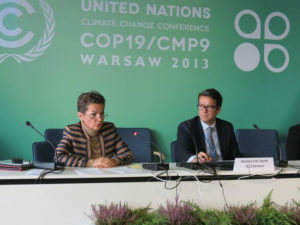 “Though there were no extraordinary advances made in Warsaw, steps for an agreement in 2015 were outlined with one major outcome being the Framework for REDD+, which includes a significant set of decisions on ways to help developing countries reduce greenhouse gas emissions from deforestation and the degradation of forests, ” said ICC Secretary General Jean-Guy Carrier. However, in order to tackle climate change with the required urgency, more must be done to facilitate the transition towards a lower emitting economy, such as more innovative investment channels in mitigation and adaptation initiatives. But accelerating and scaling up climate solutions at a faster rate also requires more clarity and the right enabling frameworks to level the global playing field, ICC said on behalf of global business. Lack of trust and confidence in the multilateral system has had a detrimental effect on these efforts. With a global network reaching 6.5 million enterprises, ICC was a key representative of the business sector in Warsaw. Chair of the ICC Commission on Environment and Energy Kersten-Karl Barth, actively participated in a number of panel discussions to promote business views while ICC also contributed to dialogue between business, government and the inter-governmental system by hosting and supporting several events which included discussions ranging from energy efficiency investments, technology cooperation and energy transition towards viable low carbon infrastructures to practical business solutions for a global deal in Paris in 2015.